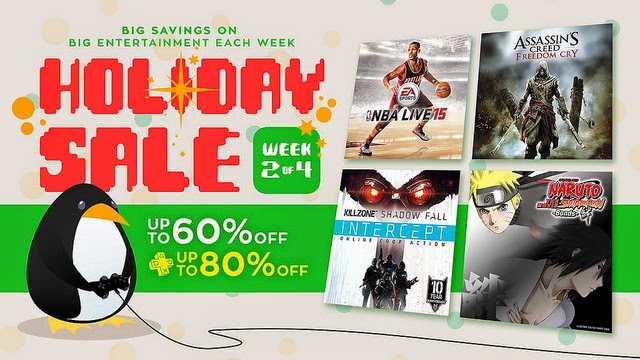 Week 2 Holiday Sales are up for PSN US! Assassin's Creed Freedom Cry (Standalone DLC) is at half-price, down half-price from US$15 to US$7.50. PS Plus members will be able to get it at just US$6! Offer is valid for both PS3 and PS4. Too bad I already have the Season Pass or this would have been a great buy. Batman: Arkham Origins Blackgate – Deluxe Edition (PS3) is also at half-price at US$9.99 for PS Plus and US$11.99 for non-PS Plus members. Anyone played this? How good is it? And the rest of the deals..
That's 2 Assassin's Creed pieces of content in the 2 weeks. Will it continue next week? Nothing interests me this week but I have been wanting to try Batman: AO Blackgate on the Vita, so maybe I'll get it on the PS3 instead. But then again.. PSN funds are running low. Might need to pass on this sale. There's also a promotion where you get $10 PS Store Credit if you use PayPal to add funds to your PSN Wallet. Promotion only lasts this week so check out all the details here. This promotion might not be eligible for those outside of the US however.